God, the world is dark at the beginning of this year. I am often anxious in the dark–of noises that frighten, of shapes that threaten, at memories that haunt. This year so much seems so much darker–the grief of the planet, the chaos in nations, the loss of hope in the community of peoples. The lives of people I love are dark. Illness, loneliness, catastrophic loss,deep sorrow, frustration and boredom all cut hug swaths of attention, intention and aspiration, energy. They, and I, struggle to keep finding the light and the places where it can get in. As I age I notice more darkness in me–my response to my limitations, with less patience for the change and decay in the world, my feeling less powerful to make a difference, fewer days in which I can persist. Yet I am sure and I trust that You are in the dark too, with me, and in the world. Along with the psalmist, I know that “my darkness is not dark to you!” When I lift up my head and look around, I see that there are glimmers of Light shining–in communities that gather to rescue, save and preserve; in churches that act on their convictions to care for the poor, widows and children; in generous souls who keep on with their acts of great love and their constant presence to those in pain, whether it is received with grace or not. So today I light my first candle of Advent to add both my witness to the Light in which I trust, and to signal my commitment to be a bearer of that Light in to the places that I go. I light it to remember that as the gospeller John tells us, You the Light are the Light of God and the darkness cannot put it, or You, out! By Your Spirit I can fan my sparks of hope, despite the “encircling gloom,” despite the ugliness that passes for common discourse in these times, no matter the catastrophe of the hour. As I write this, the radio begins to play, “Lux Aeterna,” by Morton Lauridsen, Eternal Light. Yes, Light of the Holy, You never are extinguished, even in times of deep darkness.This Advent, while feeling blanketed by darkness, I am joining Your Light for the world, even as we wait for your coming again in the world. “Tis the season…” June begins a plethora of seasons for me. As one whose days were at one time calibrated to the academic year, I am now am witness to and living into seasons determined by other factors–age, mobility, family evolution and political whimsy. Ecclesiastes tells us that there is a season for everything, a time for everything under heaven. But I wonder if the writer could have imagined the kinds of seasons that I am encountering as a person, a woman, a mother and grandmother, a church member and a citizen. For a decade or more June for me began the season of the General Assembly of the larger church to which I belong. I went to each gathering, either to participate in deliberations or to teach seminary students about both the Spirit and the instrumental working of the larger church. Hope and feelings ran high and love, every spare minute was booked and accounted for, perspectives were shared and challenged. It was a time of high adrenaline and intensity with a steep learning curve with people to whom you belonged but had never met. I have enjoyed observing from home how GA continues to change and adapt and become the next thing, with new players, new sensibilities, new energy this year. But my season at GA is over. I now take the role of the Prayerful Observer, trusting that the same Spirit that brought energy, imagination and love to the gatherings I attended does so still. While in academia June began the season of travel–faraway places like Spain, France, Germany, and The British Isles or parts of our own country like New Orleans, New England or New Mexico. Airplane, train and car were all at our disposal, and I loved the exploration, the introduction to new things, and the unfailing beauty of the unknown. I am fascinated as I follow the peregrinations of beloved ones around the world this year–Bhutan, Amsterdam, Nairobi, the Holy Land, France and Iceland. Yet for the time being this is not a season of travel for me. Surgeries, illness, needs of those for whom I care and my awareness of my aging body have kept me tethered to my home space. For now I am an Armchair Traveler, squealing with delight at picture of glaciers and waterfalls, opening wide eyes at beauty in museums and mountain ranges, laughing aloud at happy faces mugging and clowning in exotic lands. And I pray for open eyes and hearts for each one along with safety and protection. What season is it for me this June? I am discovering day by day what it might mean to be a Prayerful Observer and an Armchair Traveler. I am centered in praying without ceasing: I can’t march downtown, but I can send contributions from my computer, along with my thoughts and prayers. I can’t attend the rallying meetings around the neighborhood, but I can mail in my ballot, and encourage others to do the same. I can’t bring a casserole over, but I can offer words of encouragement and send cards of joy to “encourage the faint-hearted, help the weak, and be patient with all of them,” (I Thess. 4:14). And to bring the patience home: to be a peaceful, non-anxious presence in my own immediate sphere, stretching to the elastic and episodic needs of those in recovery, in waiting, in moving through change. It is a quieter June than past ones, but I am seeking to welcome it, invite it one, and savor the way the Spirit comes to heal, to bless and to give joy! The liturgical year comes to an end this week, and I am struggling with what am experiencing as spiritual clutter in my heart and mind: too many books, too many websites, too many blogs from others, too many fraught conversations. All of these sources are good, some even brilliant, but the sheer number of them is crowding out my ability to listen for the Word of the Holy One to me day by day. I am attracted to every shiny word and image about people’s journey of Spirit that I see. What does this young woman have to say? what insights do these theologians have to bring? how are these spiritual teachers expanding the parameters of deep conversation? and who are the latest voices to come to sit in at the table of conversation? Most of these sources are worthy, provocative and helpful. Theirs are insights and perspectives that challenge and enrich my own study and experience so far. But what I am finding is that for me right now, the engagement of “more” is crowding out the “one thing necessary” that Jesus flagged for Martha and Mary, that time of listening deeply, musing, pondering, letting the Word dwell in me richly, truly, madly deeply. I read quickly, so I can absorb lots of words in a record amount of time, but I am noticing that my rapid speed and prodigious quantities of written material are making it hard for me to hear a Word. I remember the seekers who went to the Desert Ammas and Abbas to ask, “Amma, give me a word!” Rarely were the responses given in more than one or two sentences. When that Word was given, the seeker was to go into her own life again to ponder, to meditate, to contemplate what that might mean for her in the location she was given to live. As I take the turn into Advent next week, I want to attend to the one thing necessary. It will mean ignoring and tuning out some very glittering images and plangent siren calls of What’s New, What’s Exciting and What’s Different. It will mean turning down the volume on the shrieking headlines and news updates of the hour. It will mean choosing an Advent practice wisely, and then sticking with that, and only that, while I give myself the time and space to reflect on what comes up for me. It will mean committing myself to the parts of my practice that I skate over quickly–the silence, the journal writing, the focused prayer. And keep my eyes and ears focused on the one thing I intend to do. I have already begun removing things from my basket in my prayer place. That book I nearly finished but didn’t can go to another stack of awaited reading. That diary that is more about quotidian activities than the heart of the matter can come to my reading chair for later. That journal that is really completed can be replaced by a new one that is eagerly waiting with me for a Word. And my timer can keep me rooted and breathing in my prayer place as I listen for the Word. My late spiritual director, Betsy, often quoted C.G. Jung, saying ,”The Good is the Enemy of the Best.” The good clutter all around, so readily accessible to me, is in this moment the enemy of my best hope for getting a clear channel of connection to the Holy One who is waiting to teach and direct me in these days fraught with bafflement. outrage and grief. My invitation is to un-clutter, sit still and keep my heart, eyes and ears open. I look forward to what will come in this Advent of attention. These past days have been very challenging to the way I pray. I have beloved ones in harm’s way, and I pray for their safety. And I am aware that thousands of others are in the same harm’s way, and I pray for them. I hold close some of those dear to my heart going through deep waters with health, economic and relationship issues. They are part of national and global systems which do not give them the support and the resources they need, so I am pressed to pray for them too. The captions on the day’s reporting don’t amuse, just depress even further. How do I pray? And I am coming up on a Big Birthday after a year of being bumped by things that slowed me down, another call to prayerfully re-imagine myself for the next stage! Circle me, Lord,/ Keep comfort near/and discouragement afar./Keep peace within/ and turmoil out./ Amen. For the ones in the path of the hurricanes, those known to me and those unknown: Circle them, Lord./ Keep protection near/and danger afar. For those facing the inexorable changes in the structure and systems in which they work: Circle them, Lord./Keep hope within, /keep despair without. For the one who is navigating complicated medical procedures and diagnoses: Circle her, Lord. Keep light near,/ and darkness afar. For the one who feels caught between a rock and a hard place: Circle him, Lord./Keep peace within/ and anxiety without. The Eternal Triune God shield all of them on every side. The question is raised: do these prayers work? I don’t believe that “working” is something prayers are for. The Caim Prayer is a prayer for Presence, for awareness, for hope, no matter the reality, no matter the circumstance. It focuses divine, mysterious attention on a world where the rain falls on the just and the unjust, in which we have sorrow, in which we have no permanent abiding place, in which we are waiting for the Holy One to bring all things together. And so I keep circling my heart, and the hearts, minds and bodies of the world with this prayer, even while I send checks, make phone calls, advocate for justice, listen to stories that need to be told. Another hurricane is forming, another visit to a doctor is scheduled, another tear in the seam of the broken world needs mending. So I continue to pray, Circle…and all of your beloved ones…. Lord./ Keep us all in the circle of your care. The Caim Prayer is found in Volume I of Celtic Daily Prayer, from the Northumbria Community. 2002, Harper Collins, Page 297. Personal photo from an exhibit of art from central western Africa displayed at Los Angeles County Museum of Art. I pray for peace for this anxious traveler, who worries about connections, forgotten items, anticipated glitches. Breathe your peace into my body, mind and spirit. I pray for those who make it possible for me to travel, pilots. attendants, agents and greeters and innkeepers. May each of them have what they need to do their jobs with skill and heart. I pray that I will embody a patient and merciful spirit with systems that have the capacity to break down, delay and confound. Help me to be one who brings compassion and tranquility to any chaotic kerfuffle that breaks out. I pray for those I love with whom I will abide and celebrate, each with a unique and particular personality and set of needs and wants. I pray for the Spirit to make us a peaceable realm as we hang out together for these days, not just tolerating each other, but learning to love more dearly, with exciting discoveries, deep appreciation and lots of laughter and delight. I pray that even though I will be a visiting tourist, I will also be able to see those in the area we visit with gentle and welcoming eyes and ears, that I may treat each person with respect and honor while I am given hospitality. I pray that my heart, body and mind will be open to seeing things I have never witnessed before with curiosity and interest, with great gratitude for the variety in the world that the Holy has made and in which we live. I pray, most of all, that I take Joy from the Creator in each moment of living, loving, laughing, learning, trusting that the Joy of the Holy is my strength whether I am at work or at play. I am resting in Traveling Mercies! I pray a prayer of celebration today for a joyful wedding anniversary in our family. Twenty years ago no one could have imagined or anticipated the over-arching health, love and creative children that have grown in this marriage, open and inclusive to the welfare of others. My prayer is one of deep gratitude and hope for continued shaping a life of love together. I prayer a prayer of lament today for an unwelcome diagnosis for another in the family. No one could have imagined or anticipated this invasion into a healthy life, and even now we don’t know what it means, what it will look like, where the journey will take us. My prayer is first, that God in mercy will continue the healing toward wholeness already begun, and that each of us will know how to participate in that healing, through tears, laughter and love. I prayer a prayer of urgent petition for peace and justice today for this country, buffeted about in division and question about where truth can be found. No one could have imagined or anticipated this liminal place in which we wake every day to new surprise, and can’t count on things that were true yesterday being the same today. My prayer is that people of great compassion and will speak truth to power, speak the truth in love, and know when to speak and when to keep silence for the healing of all people. I pray a prayer for an awareness Holy Presence–in me through the frustrations of technology, through the quotidian mysteries of caring for my dwelling and the people in it, through the extroversion I adopt to go out to meet people, through the words of my mouth and the meditations of my heart as I listen to the One standing behind me, saying “This is the way, walk in it.” I could not have imagined or anticipated that at this point in my life, this would be a day on which I found myself, living in light and darkness simultaneously, trying to navigate a clear path between mundane and epic concerns, living intentionally and consciously, sorting out what things have my name on them and what things to let go. But this is the day that the Spirit has made…I pray to rejoice, to weep, to do good, love mercy and walk humbly with whomever I encounter…for God’s sake! I was encompassed in silence, a gift I chose that was offered by my church, a six hour retreat on a Saturday morning. The all-purpose room was set side for sacred use–a circle of chairs, a library of books, a table of fresh food, a labyrinth laid out, a cozy room with overstuffed chairs, tables for writing and coloring and then an empty sanctuary, with an icon of Christ surrounded by candles, awaiting to be lit in prayer. After the opening instructions and a reading from the pastor, we spent our next hours in silence. My routine life is not very noisy. My husband and I don’t create much sound daily as we patter through our retirement ways of being. The loudest eruption is the dog as he tries to keep us safe from post-people and squirrels. Yet there is the hum of appliances, the whoosh of delivery trucks, the ringing of phones, even ones stopped by “nomorobo!” More incessant are the chirps and hums inside me, reminding me it is time to pay a bill, put laundry in the dryer, check on the neighbor down the street. Left to my own devices, I find it hard to enter into Silence. However, dropping into the retreat on Saturday, after I was welcomed warmly by those I knew even slightly, I could rest in the container created for me by the committee–the place, the nourishment, the prompts, the opportunities. It was pure Grace! I began by breathing, attending to my breath, checking in with my body, and then walking the labyrinth, a tool for prayer that has delighted and served me well for many years in many places. In the deliberateness of the pace, I could recognize the clutter which needed release, listen for a Word coming to me to shape the day, and then I could begin to integrate that Word with what was ahead of me. After that walk I sat down with my journal and began to note all that was coming up and where my prayers and reflections might go throughout the hours we were in silence. I listened deeply to the sacred text with which we were introduced to the day, gave thanks that I was beloved of God and that angels attended me, even in wilderness. I did some reading in Christine Valters Paintner’s book Wisdom of the Body, which has been my teacher in this Easter and Pentecost season. I spent time in gratitude for all the joy and blessing in my life. I spent time in lament for the losses of which I am so keenly aware–in my own body and experience, in the leaving of those I love, in my anxiety for the frailty of particular persons and the world. In the stained glass lighting of the sanctuary I felt free to pour out my heart about things unknown ahead of me, for those whose need seem far beyond my capacity to touch, for the broknen-ness of people and systems. 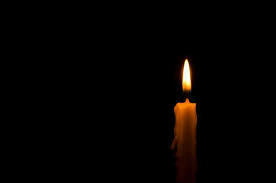 I lighted candles for some at the very top of my awareness, even now living with pain and fear. I was nourished with healthy food, silently companioning others when they chose to sit with me in silence for lunch. Bread for the journey! My heart turned toward a primary ministry I have now, a group of women who have met together for 10 years. Where are we being led? Who will keep on with us? Can we let go of those who move on? And how does our aging and growing shape what we do? What are we being invited to reflect on in the year ahead? After the hours of prayer and reflection went by, I came to a place of rest. Sitting comfortably with my eyes closed, I savored in gratitude what had been provided for me in this day. I recognized that my soul was satisfied as with a great feast by having this opportunity to be in the presence of others, yet in silence given the space, time and awareness to hear the voice of the Holy to come to me in particular–for such a time as this! I am deeply grateful for this time in which I was able to come apart and rest with the Holy in the presence of others on the journey. Savoring. Thankful. A full heart! Come. Holy Spirit! Today we celebrate your presence in our lives, in the Church and in the world. I pray to let you heal me–body and spirit–of those wounds and scars that are left over from old memories, early traumas and the hurts and slights that keep popping up in the course of my daily rounds. I pray to feel your energy surging in my recovering body, in my brain that too often forgets things these days, in my praying spirit that bogs down with the enormity and complexity of this sad world. I pray to allow your wildness keep opening my heart to finding ways when there seems to be no way, to taking in the most unlikely ones who cross my path, to putting the resources I have to the healing of the fragments of this world where I can make a difference, however small. I pray for the wounds of so many in so many places, with its accompanying fear that we can’t know where terror will break out next. I pray that You will keep up Your powerful attack on the minds and wills of those who are heartless, greedy and self-serving only, and transform their hearts to ones of compassion and caring. I pray for Your Presence in the created world, that as it struggles to survive and thrive, you will teach me how to cooperate with that healing, with Your power to give me words and actions that will preserve and respect the beauty and sustainability of Earth’s resources. I pray for Your Wisdom for all people of faith as they wrestle to know how to be observant of their commitment to You in times and events that are muddy and messy. I pray that You, Holy Healer, will touch the bodies and spirits and minds of those who suffer, and where there is despair, replace it with hope and peace. And for all those areas for which I have words but can’t get them out, and for those things deep inside me for which I have no words, Spirit, turn them into creative and cogent expressions of my heart to the Holy–for what is loving. joyful, peaceful, kind and generous, and faithful in my walking and talking, singing and dancing, working and giving, hoping and living each day with imagination, energy and love. Be still my soul, the Lord is on thy side./Bear patiently the cross of grief and pain,/in all thy ways, God faithful will remain. It comforted me, resourced and filled me when I felt very alone. We rest on Thee, our Shield and our Defender/ we go not forth alone against the foe./Strong in Thy strength and in Thy keeping tender/ we rest on Thee and in Thy name we go. A call action in a military mode, in which my part of the community saw a need to defend ourselves and our beliefs against the enemies, waiting to attack us. But we are in a different time, a more connected world, with much more expressed pain and rage, a much closer view of what is human behavior at its worst, and a continual call to imagining and being Christ’s peace in the world. So these words by Lloyd Stone and Georgia Harkness fill the tune today, my birthday, when I am in the process of recuperating from surgery, when I am given more confinement–but also more space–to actively and contemplatively give myself to the healing of this world in which I live, in which my children and grandchildren more and have their being, the world that God created, redeems and loves. ..hear my prayer, O God of all the nations, myself, I give thee, let thy will be done. Sometimes the world narrows down to just me and my present experience of the moment, even though my mind know about the infinite number of people of the world and the great capacity of the Creator who made it and who loves it. Undergoing surgery two weeks ago my only focus was my wholeness held by the Holy One, for the procedure, for the aftermath, for the recovery. And all those feel very long. Yet this song keeps pealing through my body and heart. I learned it first from my mother, whom I remember singing it, tear streaming down her face as she cooked in a steaming hot kitchen, her heart bereft with some secret sorrow. Then I heard Ethel Waters sing it in the movie, “Member of the Wedding,” and later Mahalia Jackson, commanding complete attention in Royce Hall at UCLA. Not for a second did any of the singers forget the grief and care of the world, but in the moment of singing, the microcosm of particular need to be held under the eye of God herself. echoing the Psalmist, as she prayed her personal prayer for healing and Presence was the trust-filled longing of her heart. In my recovery, I am still hearing this song in my veins, muscles, nerves, bones. I have been “watched” by the Beloved, I am being healed by the Great Physician, I am being comforted by the Spirit, and in my heart I sing.